ද්‍රෞපදී (සංස්කෘත: द्रौपदी, සංස්කෘත උච්චාරණය: [d̪rəʊpəd̪i]) යනු හින්දු වීරකාව්‍යයක් වන මහාභාරතයේ වඩාත් වැදගත් කාන්තා චරිතවලින් එකකි. වීරකාව්‍යයට අනුව, ඇය පංචාලයේ රජු වූ දෲපදගේ දියණියයි. ද්‍රෞපදීට පුත්‍රයින් පස්දෙනකු විය. ඔවුන් නම් ප්‍රතිවින්ධ්‍ය, සුතසෝම, ශ්‍රැතකර්ම, සාතනික සහ ශ්‍රැතසේනයි.‍ ද්‍රෞපදී පංච කන්‍යාවන්ගෙන් අයකු ලෙස ද සැලකේ. ද්‍රෞපදී (द्रौपदी) – දෲපදගේ දියණිය. ක්‍රිෂ්ණා (कृष्णा) – අඳුරු සමක් ඇත්තිය. පංචාලි (पाञ्चाली) – පංචාල දේශයෙන් පැමිණෙන්නිය. යාඥාසේනි (याज्ञसेनी) – යාඥාවෙන් උපන්නිය. ‍දෲපදකන්‍යා (द्रुपदकन्या) – දෲපදගේ දියණිය. සෛරන්ධ්‍රි (सैरन्ध्री) – විශේෂඥ සේවිකා (දෙවන පිටුවහල් කාලයේ ඇය විරාත් රාජධානියේ රැජිනගේ වූ සුදේශනාගේ හිසකෙස් සකසන්නිය ලෙස කටයුතු කළ සමයේ භාවිතා වූවකි). මහාභාරතී (महाभारती) – භාරතගෙන් පැවතෙන්නන් පස් දෙනාගේ මහා භාර්යාව. (ඉන්දියානු නවකථා රචිකා චෛත්‍රා චතුර්වේදී සිය 'මහාභාරතී' ග්‍රන්ථයේ ද ඇයව මේ නමින් හඳුන්වයි). පර්ෂතී (पर्षती) – පෘෂතගේ මිණිපිරිය. නිතයුවණි (नित्ययुवनी) – වියපත් නොවන්නිය. මාලිනී (मालिनी) – මාලා සාදන්නිය. යෝජනගන්ධා (योजनगन्धा) – යොදුන් ගණනක් සුවඳ දැනෙන තැනැත්තිය. Mahasweta Devi (6 December 2012). 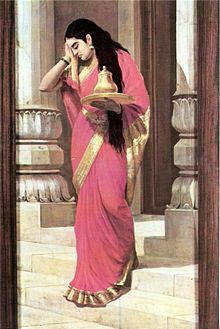 "Draupadi". මෙම කෘතිය තුල: Gayatri Chakravorty Spivak. In Other Worlds: Essays In Cultural Politics. Routledge. පි. 251. ISBN 978-1-135-07081-6. Alf Hiltebeitel (1 January 1991). The cult of Draupadī: Mythologies : from Gingee to Kurukserta. Motilal Banarsidass Publishe. පි. ii. ISBN 978-81-208-1000-6. Wendy Doniger (March 2014). On Hinduism. Oxford University Press. පි. 533. ISBN 978-0-19-936007-9. Devdutt Pattanaik (1 September 2000). The Goddess in India: The Five Faces of the Eternal Feminine. Inner Traditions / Bear & Co. පි. 98. ISBN 978-1-59477-537-6. ↑ Bhattacharya, Pradip. Five Holy Virgins, Five Sacred Myths. Manushi. http://www.manushi-india.org/pdfs_issues/PDF%20141/03%20panchakanya%204-12.pdf. ↑ "Mahabharti - A Hindi Book by - Chitra Chaturvedi - महाभारती - चित्रा चतुर्वेदी". Pustak.org. සම්ප්‍රවේශය 2013-10-20. Eminent women in the Mahabharata වනමාලා භවාල්කර් විසිනි. මහාභාරත (1999) ක්‍රිෂ්ණා ධර්මා විසිනි. හිල්ටිබෙයිට්ල්, ඇල්ෆ් (1999). Rethinking India's Oral and Classical Epics: Draupadi among Rajputs, Muslims, and Dalits. චිකාගෝ: යුනිව්ර්සිටි ඔ‍ෆ් චිකාගෝ ප්‍රෙස්. ISBN 0226340554. https://books.google.com/books?id=MMFdosx0PokC&printsec=frontcover. Retrieved 28 සැප්තැම්බර් 2015. ද්‍රෞපදී හා සබැඳි මාධ්‍ය විකිමාධ්‍ය කොමන්ස් හි ඇත. මේ පිටුව අන්තිමට සැකසුවේ 18 සැප්තැම්බර් 2017 දින දී, 13:01 වේලාවෙහිදීය.